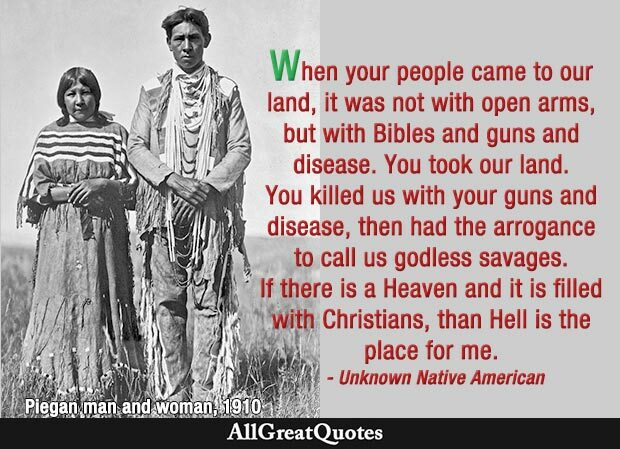 When your people came to our land, it was not with open arms, but with Bibles and guns and disease. You took our land. You killed us with your guns and disease, then had the arrogance to call us godless savages. If there is a Heaven and it is filled with Christians, than Hell is the place for me. Ponca chief on removal of Ponca Indians from Dakota Territory to Indian Territory, May 20, 1879. Has the white man become a child that he should recklessly kill and not eat? When the red men slay game, they do so that they may live and not starve. Kiowa chief’s complaint to U.S. Army commander, after witnessing soldiers and civilians wantonly killing large number of buffalo for sport. Bury My Heart at Wounded Knee: An Indian History of the American West, by Dee Brown. Chapter 11. The world was a library and its books were the stones, leaves, grass, brooks, and the birds and animals that shared, alike with us, the storms and blessings of earth. We learned to do what only the student of nature learns, and that was to feel beauty. The growing and dying of the moon reminds us of our ignorance which comes and goes, but when the moon is full it is as if the Great Spirit were upon the whole world. 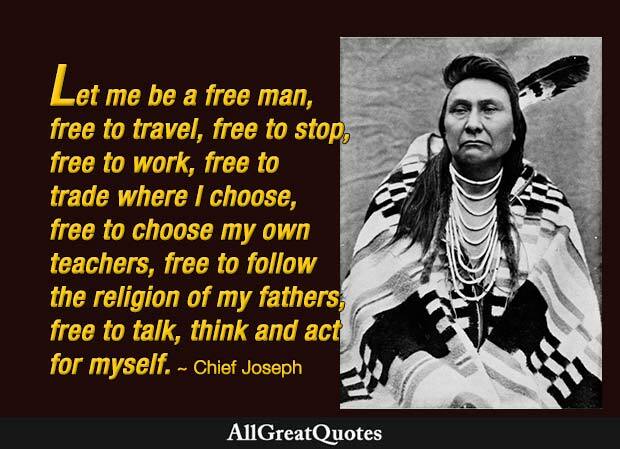 The Oglala Lakota holy man, quoted in – The Sacred Pipe, by Joseph Epes Brown. The Great Spirit is in all things: he is in the air we breathe. 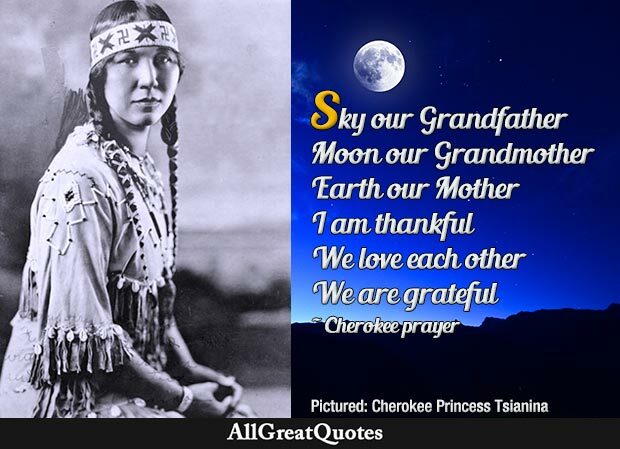 The Great Spirit is our Father, but the Earth is our Mother. She nourishes us; that which we put into the ground she returns to us. And above all, may silence make you strong..
You must begin anew and put away the wisdom of your fathers. You must lay up food and forget the hungry. When your house is built, your storeroom filled, then look around for a neighbor whom you can take advantage of and seize all he has. 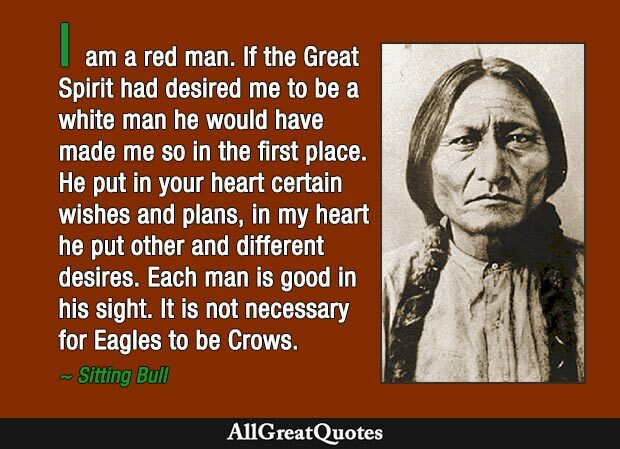 Oglala Lakota chief, when told that he must become as the white man. God is Red: A Native View of Religion, by Vine Deloria. All birds, even those of the same species, are not alike, and it is the same with animals and with human beings. The reason Wakan Tanka does not make two birds, or animals or human beings exactly alike is because each is placed here by Wakan Tanka to be an individual and to rely upon itself. Kiowa chief’s speech at Medicine Lodge, Kansas, 1867. Bury My Heart at Wounded Knee: An Indian History of the American West, by Dee Brown. Chapter 11. Iroquois chief arguing for his tribe’s property rights with Lt. Governor Thomas of Pennsylvania, in 1742. We once hunted for buffalo, we now hunt for knowledge. I was born where there are no enclosures and where everything drew a free breath. Treat the earth well, it was not given to you by your parents; it was loaned to you by your children. Let me be a free man – free to travel, free to stop, free to work, free to trade I choose, free to choose my own teachers, free to follow the religion of my fathers, free to think and talk and act for myself – and I will obey every law or submit to the penalty. The Nez Perce chief, in speech at Lincoln Hall in Washington in 1879. Bury My Heart at Wounded Knee: An Indian History of the American West by Dee Brown. The white man is in the Black Hills just like maggots, and I want you to get them out just as quick as you can. The chief of all thieves [General Custer] made a road into the Black Hills last summer, and I want the Great Father to pay the damages for what Custer has done. Sioux chief. Bury My Heart at Wounded Knee: An Indian History of the American West, by Dee Brown. Chapter 12. 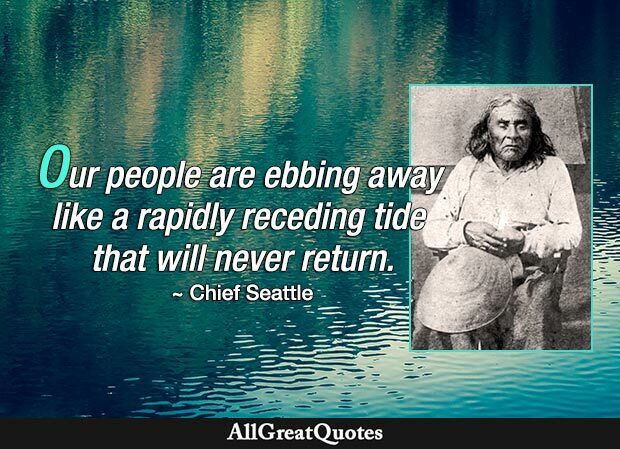 Suquamish and Duwamish chief. From his speech in 1854, published in Seattle Sunday Star in column by Dr. Henry A. Smith. I am a great chief among my people. If you kill me, it will be like a spark on the prairie. It will make a big fire – a terrible fire! Kiowa chief. Warning during his trial for murder in Texas in May, 1871. I am a red man. If the Great Spirit had desired me to be a white man he would have made me so in the first place. He put in your heart certain wishes and plans, in my heart he put other and different desires. Each man is good in his sight. It is not necessary for Eagles to be Crows. Hunkpapa Lakota chief. God Is Red: A Native View of Religion, by Vine Deloria.